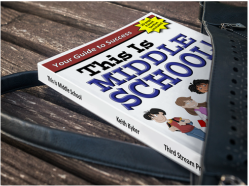 Book Excerpt - This Is Middle School! Read a Chapter from This Is Middle School! How many times have you heard your middle-schooler begin a sentence with those words? In Chapter 7: Getting Organized and Staying Informed, readers will learn tried-and-true methods for organizing and keeping track of their materials, managing their time, and staying informed on the happenings of middle school. Note: the margins appear wide because the book is 6" x 9", while the file page is 8.5" x 11".